Top: Aqua (love this and this), Skirt: Forever 21 (similar), Heels: Bebe (on sale! ), Purse: c/o Stephanie Johnson (similar) Sunglasses: Ray-Ban, Bracelet: c/o Icing, Manicure: OPI "You're Such A Budapest!" Welp...it looks like I'm a stripes + florals repeat offender. But ever since wearing this a few weeks ago, I can't seem to get enough of the combo! It's like they were made for each other, isn't it? And I have to say, this pairing was pretty effortless! I love that this is a softer, more toned down look than the one I went with previously. It's a bit more girly and a little less bold, but I love the pastel colors in the skirt paired with the cobalt blue. And since I had planned this outfit the night before, I couldn't help but paint my nails to match the light purple flowers. They're hard to see, but I promise they're there! Now...if only getting dressed always seemed to come together this easily! So cute - I literally wore a very similar combination to this yesterday, but the shorts were striped & the top was floral...love it! No better combo than stripes and florals..love this look! Love stripes & florals together- wore the mix on my blog yesterday! And those shoes never get old- so pretty! Adorable and love the attention to detail you have by painting your nails! Love that striped top, too. Can I please have your hair? How do you make it look so fabulous every day? Lovin' the stripes! 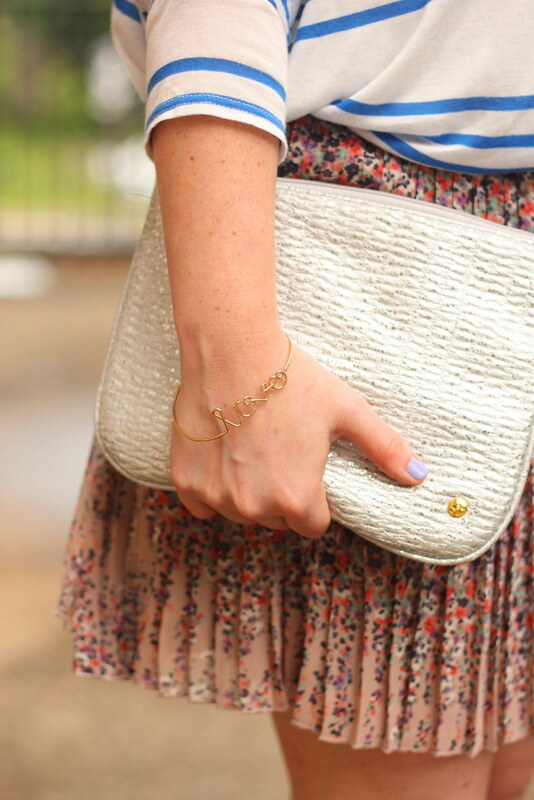 Definitely my go-to print-mixing look, love the flouncy floral skirt! That skirt looks like so much fun to twirl around in! I have the same style in black from loft, but who could pass up the print version from F21? !